I SAW the sweet little old lady a bit too late. Knowing that the fiery orange machine I was driving had a tendency to scare the living daylights out of people, I didn't want to do it, but there was no time to change tack. As I backed off on the accelerator the four fat exhaust pipes started playing their song - like a pack of double bangers thrown into a metal letterbox used to back in the day. There was no getting around it, and as she jumped in the air, doubling her impressive four-and-a-half-foot height, I felt a pang of guilt for terrifying the nice old dear. Then she landed in a way that only those who have avoided needing a hip replacement can and in one two-fingered gesture destroyed any remorse I felt for freaking out someone's octogenarian gran. So I flicked the F-Type's paddle and decked it, and let her enjoy the other song in the new Jag's jukebox "Supercharged V8 wide open". Great track, but I'm not sure she liked it. This is Jaguar's first real sportscar in five decades - forgetting the ever-present R models and unobtainable supercars like the XJ220 - and the company banked a lot on it. It must be said, despite the obvious irony in an Indian company taking over two of the most well-known British brands, Ratan Tata has taken Jaguar from being a fading former star of the Empire to becoming an extremely desirable vehicle. 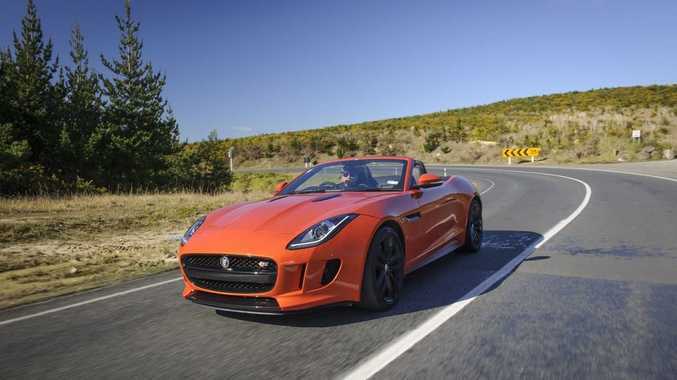 And as good as new models like the XF sedan and the executive express XJ are, the F-Type is the one. Its spiritual granddaddy, the E-Type was a groundbreaking beast in its day, and when I first saw the F-Type unveiled last year, I hoped Jaguar would have stretched its design a bit further, to make it as memorable as that long and low classic. The long, purposeful bonnet screams "go" and, with the pronounced rear haunches giving the car a real sense of power before disappearing to emphasise its big, flat boot lid, Jag designer Ian Callum has excelled himself and created a truly beautiful sportscar. And they've stuffed a blown five-litre V8 in it as well as giving drivers enough handling freedom to enjoy taking it for an enthusiastic spin without it getting too hairy. There are three specs available here - the F-Type, V6 S and this monster. During a quick drive a month or so back, the supercharged six seemed to be the pick of the pack, but with the extra power and monumental soundtrack, it's hard not to look at the range-topper. At $201,945, it' s not exactly going to sell here in the dozens, but it is already giving the importer something to smile about. It turns heads, it's giving the dealers something to put on a pedestal and it makes the brand cool again - at up to 300kmh. The fifty-fifty weight balance is where the secret lies - and as it only tips the scales at 1660-odd kilograms, there's not a lot of heft to worry about. The 364kW beast under the bonnet, which unleashes a savage 625Nm of torque from just 2500rpm, makes good use of its power-to-pork ratio, especially on twisty open road sections. This bucketload of power is put to the ground via an eight-speed ZF automatic, with the obligatory flappy paddle shifters, and despite the fact that much of the car's European competition offer dual-clutch robotic manuals, the auto feels surprisingly sharp with clean shifts between cogs and quick enough gear changes that it doesn't ever feel too slow for the application. In economy terms - as if this really concerns buyers of supercharged eight-pot convertibles - the Jag claim is 11.1L/100km combining highway and city driving. It might just be the excitement of driving such a good car that made my average sit around 17.5L/100km (almost exactly the same as whoever drove it before me), but when you sit it in "nice" mode, pop it into D for Don't Do It and puddle along like you're going grocery shopping, it should be capable of reasonably frugal figures. Rather than a mechanical limited slip diff for the F-Type V8 S, the Jag is fitted with an electronic active system which proves a real godsend when you've taken a deep breath, pushed the wondrous "loud button" switched the car to "dynamic mode" and headed for the hills. When driving in normal setting the back doesn't step out too radically unless you're really giving it a shove, but the 20-inch rims dressed in 195/30 rubber still scramble for grip under heavy acceleration. In dynamic mode it lets you play with the power a bit more, swinging its short tail around nicely, safe in the knowledge that the outlandishly responsive and direct steering rack and abundance of grunt are there to gather it all in again. There's enough stopping power to cope with most situations, with grippy pads on big 380mm rotors at the front and 376mm at the rear. Its interior isn't the largest, with the driver divided from the passenger with a beefy centre console, giving a very focused driving position, and the dash itself is brilliantly executed with solid-feeling switchgear and nicely finished gauges leaving no illusion as to what the F-Type's purpose is. That's if the noise and cannonball acceleration don't tip you off. Off the line, it's a rocket - 4.3 seconds is the factory claim to 100kmh with an electronically-enforced cutout stopping the party at treble the legal limit. But when you're rolling at anything above about 40kmh and jump on the accelerator it really is something else. We're lucky enough to drive some pretty quick cars - and the V8 S certainly foots it with the best of them. Those with shopping lists in German will be looking Jag's way - for the first time in years - and with good reason. It's a beautiful monster with an engine note that forces anti-social behaviour just to hear it. Just try and avoid rest homes, it does tend to turn friendly Grey Power members into angry nanas.